Dr. Katie Pinkus and Dr. Brenton Pinkus opened Pinkus Family Chiropractic in 2002. 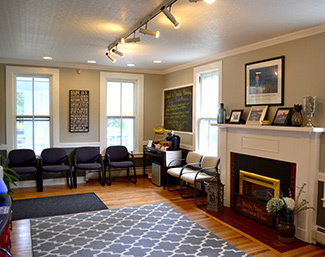 At a true family practice, our husband-and-wife team sees all ages of people at our wellness-based chiropractic care center. In our small community, we have the privilege of seeing babies, moms, dads and grandparents, most of whom seek us out from word of mouth. Children are especially welcome to experience the many advantages of pediatric chiropractic care. Dr. Katie and Dr. Brenton’s own three daughters have gained numerous benefits from our natural approach to health, and we love sharing what we have to offer with area families. Dr. Katie has undertaken additional training and has a certificate in Pediatrics, as well as studying with the Epic Pediatrics program. Dr. Brenton, as a former professional soccer player, emphasizes the importance of chiropractic care for athletes. Whether you have an injury that won’t go away or seek to improve your performance levels, we welcome the opportunity to help you. Why Choose Pinkus Family Chiropractic? Contact our Manchester office today to learn more about what we do or to schedule your appointment!